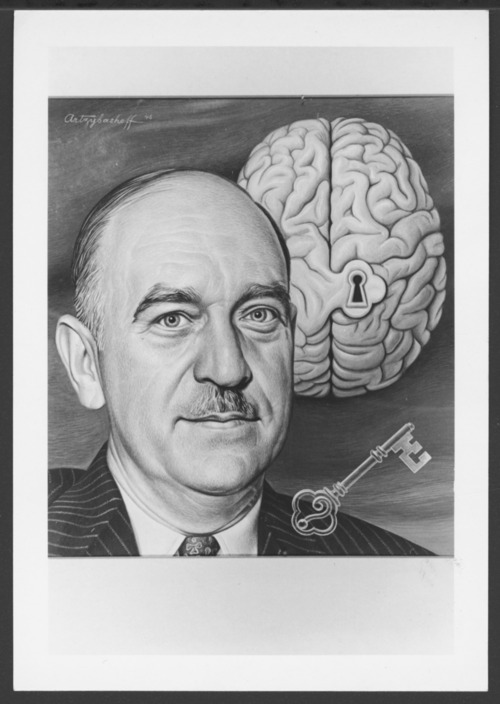 This photograph shows Dr. Will Menninger's portrait as it was published on Time magazine. "Dr. Will" and his father, Dr. C.F. Menninger and his brother "Dr. Karl" established the Menninger Clinic, originally in Topeka, Kansas, but now located in Houston, Texas. Dr. Will was instrumental in establishing the Menninger School of Psychiatry in Topeka, to care for the veterans of WWII. He is known as one of the key influences in the development of a psychiatric guide which later became known as the Diagnostic and Statistical Manual of Mental Disorders.